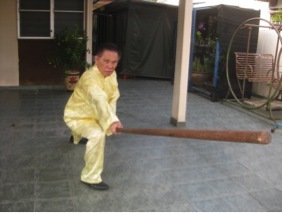 One night, at Sifu Choe Hoong Choy’s house where he taught Wing Choon Kungfu in the garden at the back of his house, Uncle Cheong, a senior disciple of Sifu Choe Hoong Choy and well-respected kungfu master in his own right, visited the school. Some senior students were practising a staff set called Thirteen-Techniques Spear. Despite its name, it was a staff set, and a long tapering staff was used. The students asked Uncle Cheong, who was an expert of the staff, about the combat application of a pattern called “High Mountain Flows Water”, where a staff was held slantingly away from the practitioner’s body with the head of the staff above the practitioner’s head, and the tapering tail of the staff slanting away almost touching the floor. He then asked the student to sweep his legs and he blocked the attack using this pattern, “High Mountain Flows Water”. “Kit Chye” (杰仔) was the name they called me. Other students would call me “Kit Kor” (杰哥), which means Elder Brother Kit. “Kit Chye” is an endearing term, often used by parents to call their children or elders to call their loved ones. It means “Kit, my lovely boy”. “Uncle Cheong is an expert of the staff,” I replied indirectly. “They are senior students. There’s no harm telling them one or two secrets,” Sifu Choe Hoong Choy said. 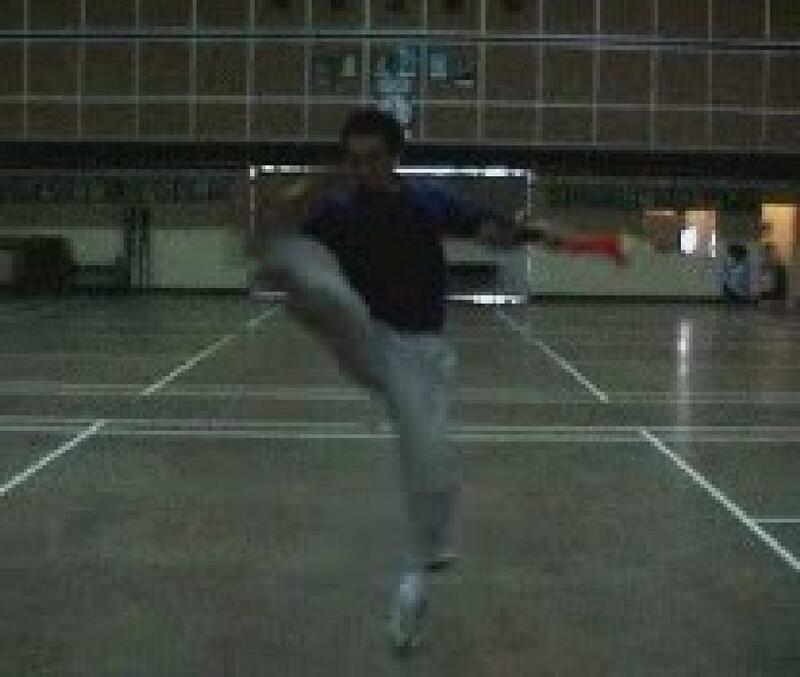 I took over the staff from Uncle Cheong, and asked the senior student to attack me with a low sweep. As he did so, I blocked the attack as Uncle Cheong did earlier, but with the end of the staff gently hitting the attacker’s lower leg. I asked him to attack again. I performed the same pattern blocking his attack, but this time with the tip of the staff pointing just an inch above a vital point between his lower leg and his foot. Sifu Choe Hoong Choy and Uncle Cheong smiled noddingly. 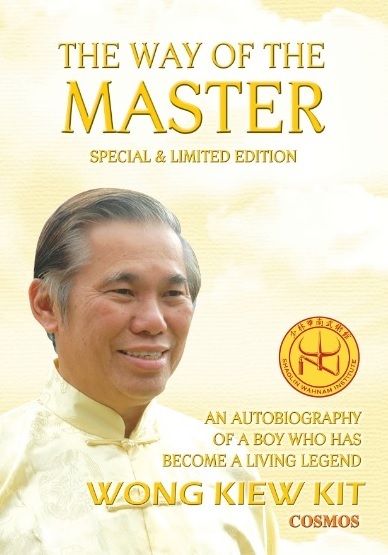 This entry was posted in autobiography, Books, Grandmaster Wong Kiew Kit, Kung Fu, Kung Fu Weapons, Shaolin, Shaolin Wahnam, The Way of the Master and tagged autobiography, Books, Grandmaster Wong Kiew Kit, Kung Fu, kung fu weapons, Shaolin, Shaolin Wahnam, Way of the Master, Weapons on October 24, 2017 by Wei Joo Lee. I discovered the Shaolin arts and philosophy, and I am strongly attracted to the original traditional Shaolin lifestyle. Although my age is 59, I like to gain strength, solace, flexibility, health and fitness and spiritual health, and longevity and vitality at old age. I am a physician in cardiovascular medicine and general medicine. I encounter a lot of fear, anxiety and stress in my patients. So, it is good and wise to acquire Shaolin training myself and develop myself in order to help others for a very long time. I am convinced that Shoalin Kungfu, qi gong and Zen will help. I am aware of the holistic principle and combat form and meaning of the movements as well as universal energy. Could you recommend to me where and how I can have the best and genuine Shoalin training? How do I start? Please take into account that I am just starting and a beginner. I will read all your books in advance to get maximum information. I am also aware of the need to persevere. At present I am reading your book, “The Complete book of Shaolin”. The other books will follow. But I understand that one doesn’t learn from a book, one learns from practice, instruction and repeating even blindly. It is inspiring that you intend to have good health, vitality, longevity, mental freshness and spiritual joys (irrespective of one’s religion) starting at 59. Indeed many of my students over 60 told me that they were healthier and fitter than they were at 30. It is also inspiring that you wish to give confidence to your patients. When you are proficient in chi kung, you can teach your patients some simple chi kung exercise to give them confidence and increase their energy level as a supplement to the normal treatment you give them. I would take this opportunity to explain that when you teach your patients simple chi kung exercise, you must not teach them at the same level that you practice, because doing so would cause them harm rather than benefit. You must teach them at a much lower level that is suitable for them. Will you have harm instead of benefit if you practice at a high level? No, you will not. You will have more benefits. Why is this so? This is because you attend my courses not only to practice chi kung at a high level but also learn remedial exercise to overcome harmful effects if you unknowingly make mistakes. But your patients do not have these benefits. So you only teach them at a low level of chi kung that is safe for them even if they make mistakes unknowingly. When you meet me in person, please remind me to show you about teaching and performing chi kung at different levels. I would also take this opportunity to explain that what many chi kung instrucrtors teach nowadays is not chi kung but gentle physical exercise although they and their students use chi kung techniques. This statement is made in good faith, and not meant to belittle these chi kung instructors, who are usually kind and have good intention, but they themselves may not realize this important fact. Similarly, many Tai Chi instructors and students today do not realize that what they teach and practice is not Tai Chi Chuan, which is an internal martial art, but some external Tai Chi forms although they use genuine Tai Chi Chuan techniques. Gentle physical exercise does not give confidence and increase energy level. That is why many chi kung practitioners today are still weak and sick because actually they practice gentle physical exercise, and not chi kung, which is meant to make practitioners strong and healthy. I suggest the following option. Attend my Intensive Chi Kung Course. Continue to practice on your own at home. It is sufficient if you practice just about 15 minutes daily. If you can, join a regular chi kung class taught by one of our certified Shaolin Wahnam instructors. If this is not feasible, you can practice on your own at home. You should be able to achieve the two aims above in about 6 months. Please see my courses and time-table on my home page. Please apply to the respective honorary organizer as soon as possible. You can attend my Intensive Chi Kung Course without any prior chi kung experience. But if you wish to learn Shaolin Kungfu or Tai Chi Chuan from me, you need some prior experience. 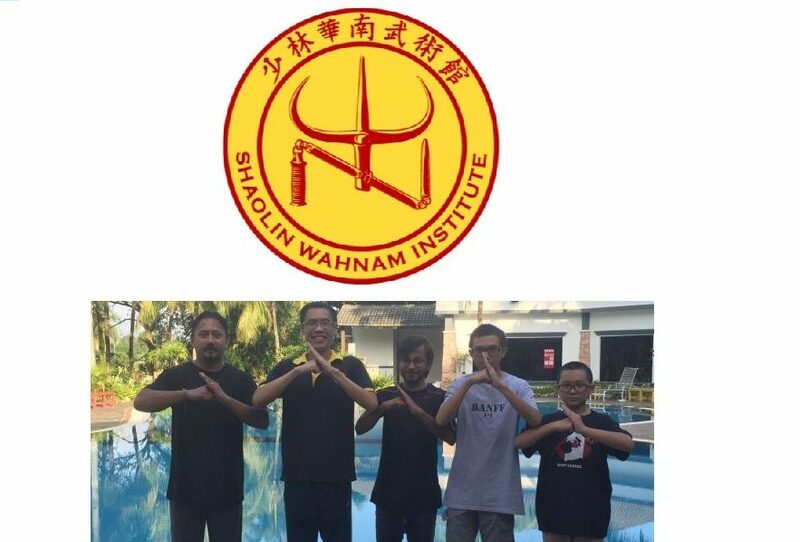 You can first learn some Shaolin Kungfu or Tai Chi Chuan from any of our certified instructors, or from any competent instructors outside our school. 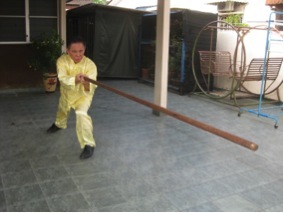 Then attend my Intensive Shaolin Kungfu Course or Intensive Taijiquan (Tai Chi Chuan) Course. The hormonal changes were compounded by stress at work and lack of sleep.. Doctors told us that the disease is simply incurable and the only choice is the wig. I hope chi kung could be a miracle cure for my wife, as the disease has likely been caused by hormonal changes in her body. Chi Kung could be the only chance to overcome the condition. I am sorry to hear about your wife’s condition. But the good news is that she has a good chance to recover if she practices genuine, high-level chi kung. Please note there are two dimensions in the term “genuine high-level chi kung”, namely the chi kung practiced must be genuine, and it must be of a high level. For various reasons much of chi kung practiced today all over the world is not really chi kung but gentle physical exercise although practitioners use genuine chi kung techniques. Many people may be puzzled by this statement. How could their practice not be genuine chi kung when they practice genuine chi kung techniques? They will have a better idea if we use a more familiar example of Taijiquan (Tai Chi Chuan). Genuine Taijiquan is an internal martial art, but most people today practice it as an external dance-like form without any internal or martial aspect. 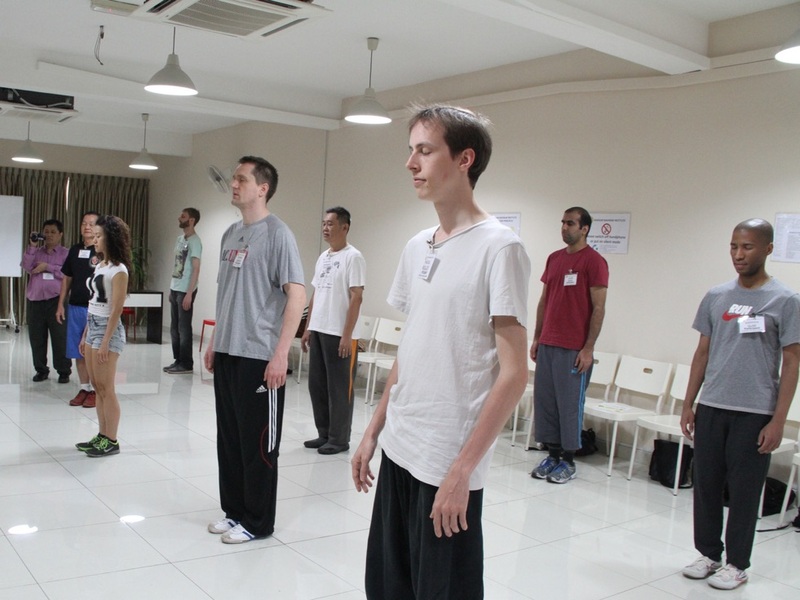 But these dance-like practitioners use genuine Taijiquan techniques. They only can perform the external form of the techniques, but they do not have the skills to perform these techniques to develop internal force, and they also do not have the skills to apply these techniques for combat. It is the same as chi kung. Most people only practice the external form of chi kung techniques, but they do not have the skills to use these techniques to generate an energy flow. Energy flow is the essence of chi kung. It is the energy flow that gives chi kung benefits, like overcoming illness and promoting good health, vitality and longevity. Merely performing the external forms does not give these benefits. In other words, no matter what chi kung techniques your wife practices, and no matter how beautifully and for how long, if she cannot generate an energy flow, she will not be able to overcome her health problem. So, it is not a question of which chi kung exercise is good for her, but how effectively she can generate an energy flow. For this, she has to learn from a competent teacher. Without energy flow, practitioners perform chi kung techniques as gentle physical exercise. It is energy flow that makes the practice as chi kung, which means energy art. The second point is that the energy flow must be powerful enough to bring result. Even if the chi kung is genuine, if the energy flow is weak, which means the chi kung is of a low level, it may not be sufficient to help your wife overcome her problem. Your wife must practice high-level chi kung under the supervision of a competent teacher to overcome her hormonal imbalance and eventually to have normal hair growth. Seek chi kung healing from the Holistic Health Cultivation Centre in Kuala Lumpur, Malaysia. Your wife is guaranteed to be cured within a year, or else she can have her money back. But she must attend daily healing sessions at the centre. Your wife can learn chi kung from our instructors in UK. Please see our List of Instructors for information. Attend my Intensive Chi Kung Course where she will learn how to generate an energy flow. She has to continue to practice on her own after the course. Please apply to my secretary for registration. Please see my home page for more details. We understand that the child of 4 is more like a baby in development. Therefore we are not sure he will understand instructions for “Lifting the Sky”, etc. In such an instance how would you proceed to encourage chi flow? Here are various ways to help those who may not be able to perform chi kung exercises themselves, like the child, to have chi flow to overcome their health problems. You can channel chi to him. His parents can learn chi kung from you, and then channel chi to him by stroking the child about half a foot from the child’s body from head to limbs, and from centre to extremities 2 or 3 times a day but not at noon. You can transmit chi on water and let the child drink it. You can transmit chi onto some suitable object, like a coin or a tiny pad, and let the child wear it on its body. Depending on the chi stored in the object, it may have to be renewed once a week or once a month. I have personal experiences to verify that all the above methods work. In my early years of chi kung healing I used to channel chi to patients. Later I found it more beneficial for them to generate chi flow themselves. If the patients were too young or unable to practice chi kung themselves, their parents would practice and then channel chi to them. When people brought their babies or small children to consult me at my chi kung clinic which I operated in Sungai Petani in my early years, and the babies or small children were too small to practice chi kung, I channel my chi to water or suitable objects for them. It worked very well. This was inspired from seeing patients drinking sanctified water made from ashes of talismans given by deities in my childhood days as well as by Immortal Li at my sifu’s temple. Often these patients had seen many doctors to no avail, but were cured of their ailments by drinking this sanctified water. Whether people believe in such methods is a different issues, but the fact remained that the patients were cured. I was puzzled by this fact. Later I concluded that the deities transmitted their chi or blessings to talismans, and the chi or blessings were transmitted to the sanctified water. For the treatment to be successful, the parents must pay a high fee for your chi kung treatment. If you do it for free, or charge an average fee, the parents may not appreciate it and the treatment may not work. They must want the treatment enough to pay a high fee for it. The issue is not whether they are rich or poor. The issue is the value they place on their child’s recovery. Even if they cannot afford the healing fee, they will borrow the money if they value their child’s recovery highly enough. And even when your fee is high, it is still low compared to the child’s good health. After all, the child’s problem is supposed to be “incurable” by conventional medicine. I feel at a loss in that it seems I do not know how to not worry, intellectualize, and yet still make decisions, interact with life. I don’t know how to care and do, without deciding what to do via contemplating and intellectualizing. I do not understand how to do things, like decide whether to take a job that I feel too tired for but need money, or the best route to help connect my family with help they need, or where to live now with no permanent home, or to decide what attitude to have with regards to my friend. With so much up in the air in my chaotic life, I do not know how to get through all of it without thinking and contemplating and considering it all, planning, making positive and negative lists, considering, but it gets all crazy in my head with the thoughts just causing storms. The thought processes are huge surges of over-thinking, like Attention Deficiency Disorder and Obsessive Compulsive Disorder (OCD). If you run blindly across a busy street, you risk being hit by a motor vehicle. So you just don’t do it. It is very simple. If you jump down a three-story building, you risk to have your legs broken. So you just don’t do it. It is very simple. If you continue worrying and intellectualizing, you risk to be more and more sick. So, you just don’t do it. It is very simple. Not to worry and not to intellectualize is far less demanding than not to run blindly across a busy street, or not to jump down from a three-storey building. If you fail in the task, you don’t have to die. But if you fail to stop running blindly across a busy street, or fail to stop jumping down from a three-storey building, you may lose your life. Don’t do something is easier than doing something. Don’t worry and don’t intellectualize is easier than worry and intellectualize. You just don’t do it. If you have to do something, or want to do something, just do it. You don’t need to worry or intellectualize about it. If you want to eat your dinner, just eat your dinner and enjoy it. You don’t have to worry or intellectualize how you should eat your dinner or whether you should wear a blue dress or a red dress while eating your dinner. Here is my current plan. I honestly feel that my dad’s best hope of recovery is if he comes to the Kuala Lampur program for one year, and has energetic assistance every day. My father fears traveling in non-Western countries where diarrhea and pathogen illness is common for travelers. He got very ill once in Mexico. I do not know if I will be able to get him there, but I hope so. As of now, he is refusing for fear of getting sick like I did and also because he is so tired to travel that far, and can’t imagine staying a full year. I am working with my family on how to speak with dad in a less confrontational way, more feminine, and less telling him what to do. He is now so impaired by the Alzheimer’s aspect of the Parkinson’s Disease that he is becoming more and more like a belligerent child. He apparently has now started refusing to put on a seatbelt — it is hard for him to do it, but he has always done that, and now it’s just all so weird. He’s so angry at his state and his mind is so not its normal self. My “old” dad would never ever behave the way he is now. In April, they are agreeing to come to a class with you in Canada or the United States. I hope you will have a class you think suitable for them. I am watching the website. Then I will stay with them maybe another month or so to keep their practice going. I am not feeling good about staying into summer, as that is high risk season, when infection is much more likely. It is not safe to be outdoors, as their area is hyper Lyme endemic, and they live in the woods. He has a hope to fully be cured if he goes to Holistic Health Cultivation Centre in Kuala Lampur. If you want to ask your father to go to the Holistic Health Cultivation Centre in Kuala Lumpur or to attend my courses in Canada or the United States, just do it. If you father wants to come to the Centre or attend my course, just do it. There is no need to worry and intellectuzlize. 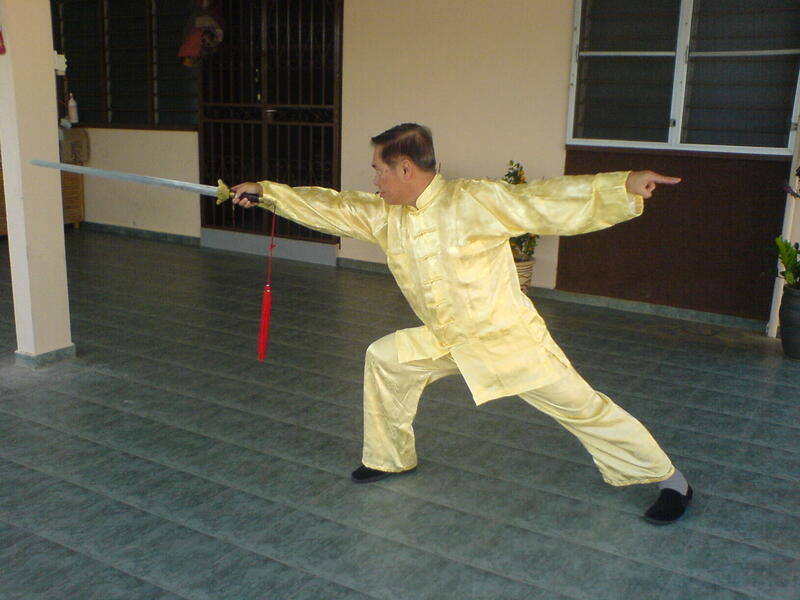 I’m just a bit curious about unsheathing swords in Chinese kungfu, Are there any techniques to unsheath your sword from your back? You just pull the sword out with your hand. If the sword is long, you may have to bend your body forward. What I was trying to clarify was whether a swordsman actually used the scabbard in Chinese martial art. Did he use his scabbard to block an opponent’s weapon? A swordsman used the scabbard to keep his sword. He used his sword for fighting. When he met an inferior opponent, for fun he might use the scabbard, with his sword in it, so as not to hurt his opponent. Using the scabbard or his sword to block an opponent’s weapon was a clear indication that he did not know how to use his sword skillfully. The hallmark of Chinese swordsmanship was agility. A swordsman might sometimes use his sword to deflect an opponent’s weapon, but he never used his sword, or its scabbard, to block it. His excellent swordsmanship was a sharp contrast to what I saw in a Kendo class in my young days. Two combatants put on cage-like protection gear and hit (or slash) each other with their wooden swords. In 5 minutes they hit each other more than 30 times. It was hilarious. There was no attempt at all to defend against any attack. It was good for executives to let off steam. The swordsman in the second video was mediocre. Notice that in the many encounters this swordsman in the second video needed three moves to finish his opponent when the swordsman in the first video needed only one. The opponent in the second video had to freeze himself to allow the swordsman to complete his three moves. In the first video, the swordsman finished off the opponent as soon as the opponent made a move. Another question, if you don’t mind. Are there any shield techniques in Shaolin Kung Fu, shield techniques as in Sword and shield, etc? Yes, there are shield techniques in Shaolin Kungfu. In the past the shield was listed as one of the 18 main weapons, indicating the importance Chinese martial artists considered the shield to be. In battle formations, solders often used shields to cover themselves from charges of lances or from rains of arrows afar. Nevertheless, the shield is not used in conjunction with the sword. It is because using the shield with the sword would distract, rather than contribute, to combat efficiency. The shield is sometimes used in conjunction with the sabre, and sometimes with one Butterfly Knife. In Chinese martial art, the sword, known as “jian”, is different from a sabre, known as “dao”. 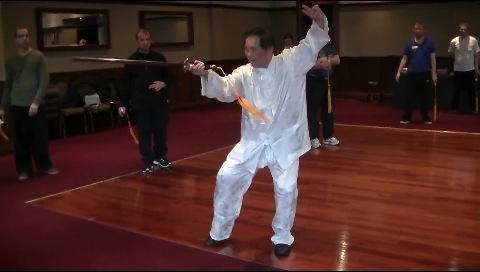 Using a Chinese sword like a sabre, as is sometimes seen in kungfu movies, is a clear indication that the user does not know how to use a sword properly, though many people may not realize it. A sword is double-edged and is light, whereas a sabre is single-edged and is heavy. Application of the sword depends much on the wrist, whereas application of the sabre depends much on the arm. In strict kungfu terminology, the Samurai sword and many European swords are sabres, but since their terms have become established, they are being continuously used. Due to lack of deeper understanding amongst most Chinese, some kungfu terms have been misrepresented, and subsequently mistranslated into English. For example, Shaolin Kungfu is usually regarded as hard and external. As I have often mentioned, much to the displeasure of some people, there are more soft and internal aspects in Shaolin Kungfu than all the internal arts put together! Xingyiquan (often spelt as Hsing Yi Chuan) is usually grouped together with Taijiquan (Tai Chi Chuan) and Baguazhang (Pa Kua Chang) as Wudang Kungfu and regarded as Taoist. The facts are that there is nothing Wudang and nothing Taoist about Xingyiquan, except the fundamental Xingyiquan set is called Five-Element Fist. It may be worthwhile to mention the following facts, especially for those who may be dualistic in their thinking. Saying that there is nothing Wudang and nothing Taoist in Xingyiquan does not distract from the great value of Wudang Kungfu and Taoist practice. Just as saying that a bicycle is not a computer does not distract from the value of a computer. The Five Elements are also found in Shaolin. Different versions of the Five-Element Fist, for example, are popularly practiced in some Hoong Ka and Choy-Li-Fatt schools. The term “Five Elements” is also wrongly translated! In Chinese the term is “wu xing”, which means “five movements”. To say that the world is made up of five elements, namely metal, wood, water, fire and earth, is factually wrong. What is meant is that the countless movements or processes in the world can be classified into five archetypes, represented by metal, which indicates resonance, wood, which indicates growth, water, which indicates spreading, fire, which indicates rising, and earth, which indicates coming together. As the term “Five Elements” has become established, it is being used, often without realizing its misrepresentation. Personally, I prefer to use the term “Five Elemental Processes”, maintaining the established root “element” as well as to indicate that the processes are elemental. This entry was posted in chi flow, Chi Kung, Chi Kung Healing, Grandmaster Wong Kiew Kit, holistic health cultivation center, Intensive Chi Kung Course, Intensive Kung Fu Course, Kung Fu, Kung Fu Weapons, question-answer, Shaolin, Shaolin Wahnam, Sifu Foong Tuck Meng, Sifu Wong Chun Nga, tai chi chuan, taijiquan and tagged chi flow, chi kung, chi kung healing, Grandmaster Wong Kiew Kit, Holistc Health Cultivation Center, Kung Fu, kung fu weapons, QUESTIONANSWERS, Shaolin, Shaolin Wahnam, Sifu Foong Tuck Meng, Sifu Wong Chun Nga, tai chi chuan, taijiquan, Weapons on January 9, 2016 by Wei Joo Lee. In relation to clarity of mind which I discussed in my earlier post, I would like to introduce an appropriate weapon that trains shen, the chinese sword or jian. I must stress that the chinese sword is very much different from a western sword or samurai sword. The western swords and samurai swords are usually very heavy, and are used to chop, slash and hack at opponents. The chinese sword, on the other hand, is a dainty weapon that is light in comparison. It is used to slice and pierce at specific targets of the opponent. The western sword, or saber, and samurai sword more closely resemble the chinese dao. The chinese dao is compared to a ferocious tiger whereas the chinese jian resembles a nimble phoenix. For example, I composed the short poem above to give poetic meaning to the functions and essence of the dao and jian in a short, concise manner. I credit my Shaolin Wahnam training which gave me the sudden inspiration and clarity of shen to create the impromptu poem. Training with the respective weapons long enough will eventually imbue upon the practitioner the qualities of the weapons. A person training with a dao will eventually become more courageous and firm. A person training with a jian will develop his mental capabilities, hence the jian is the choice of weapon among scholar-warriors. In closing, I would like to point out that our school uses the term knife to apply to the dao to maintain the chinese flavor. The jian is labeled as a Chinese sword. In Chinese, the sword refers to a light, straight, two-edged weapon, whereas a knife is heavier, curved and single-edged. The techniques and skills in using a Kung Fu knife are, naturally, different from those of a Chinese sword. This entry was posted in Kung Fu Weapons and tagged Kung Fu, Shaolin Wahnam, Weapons on December 4, 2009 by Wei Joo Lee.